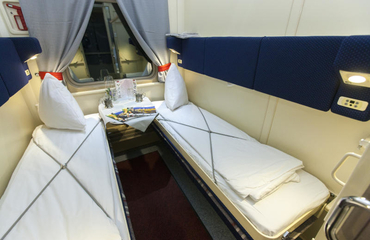 The company train "Megapolis" is the first private train of the railway passenger company "Tverskoy Express". 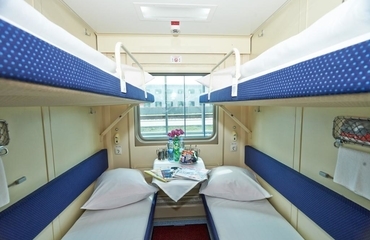 Design and interior details were developed specifically for the Megapolis train. The main colors are orange and blue. Free wi-fi is available for all the passengers of Megapolis train. 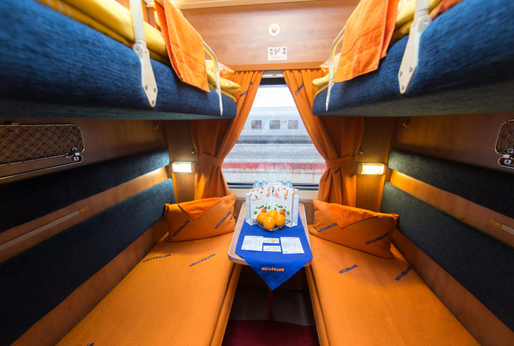 A cozy restaurant car offers a varied menu and a possibility of advance reservation of the tables. Seats: 2 lower berths. Berths arrangement / number: horizontal / 2. Included service: hot breakfast and cold snacks, tea/coffee, hygienic kit, sleepers. Amenities: a/c, socket, Wi-Fi, mirror, folding table. Carriage: 9 compartments, 2 toilets. Seats: 2 lower berths. Berths arrangement / number: horizontal / 2. Included service: hot breakfast, tea/coffee, sleepers. Amenities: a/c, socket, Wi-Fi, mirror, folding table. Carriage: 9 compartments, 2 toilets. Seats: 2 lower berths. Berths arrangement / number: horizontal / 2. Included service: sleepers. Amenities: a/c, socket, Wi-Fi, mirror, folding table. Carriage: 9 compartments, 2 toilets. Seats: 2 lower and 2 upper berths (folding). Berths arrangement / number: 2+2. Included service: hot meal. Amenities: a/c, Wi-Fi, folding table. Carriage: 9 compartments, 2 toilets, sockets. Seats: 2 lower and 2 upper berths (folding). Berths arrangement / number: 2+2. Included service: -. Amenities: a/c, Wi-Fi, folding table. Carriage: 9 compartments, 2 toilets, sockets.